One vote can make all the difference, we are told. But in California there are people and forces that wield a thousand — if not a billion — times the power of the voter. That influence flows from talent, persistence and, most of all, money. In the last election cycle, donors gave $1.6 billion to candidates, political committees and parties, according to state records. Moreover, that whopping total from the 2015-16 cycle doesn’t include funding for federal campaigns and local races such as city councils and county boards. Heaven knows what the final 2018 tally will be. Special interests and other influencers also lobby public officials. Overall lobbyist spending for the 2017-18 cycle thus far is $341 million. 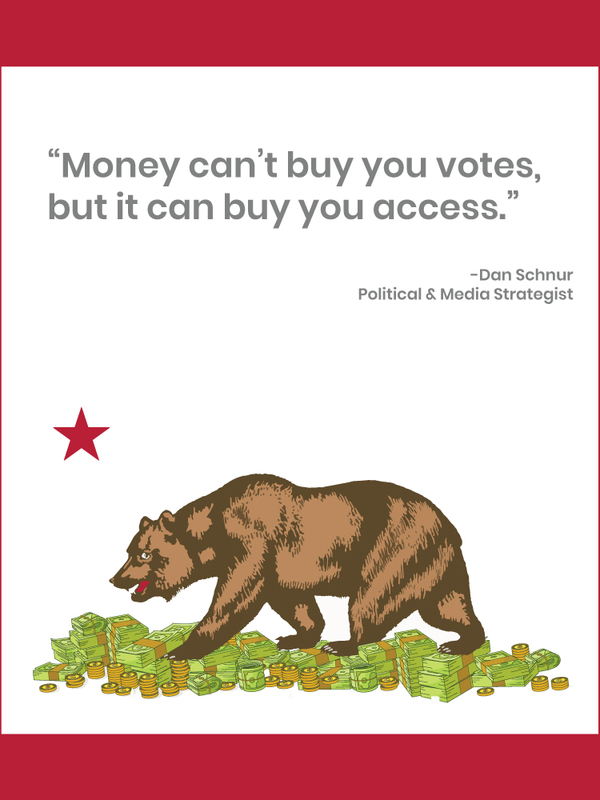 “Money doesn’t buy you votes, but it can buy you access,” says Dan Schnur, a good government expert and political communication lecturer at USC. Is it any wonder, after some bills are passed, that the average voter asks, what in the world are these politicians thinking? Since the discovery of gold at Sutter’s Creek in 1849, California has been a dream destination. 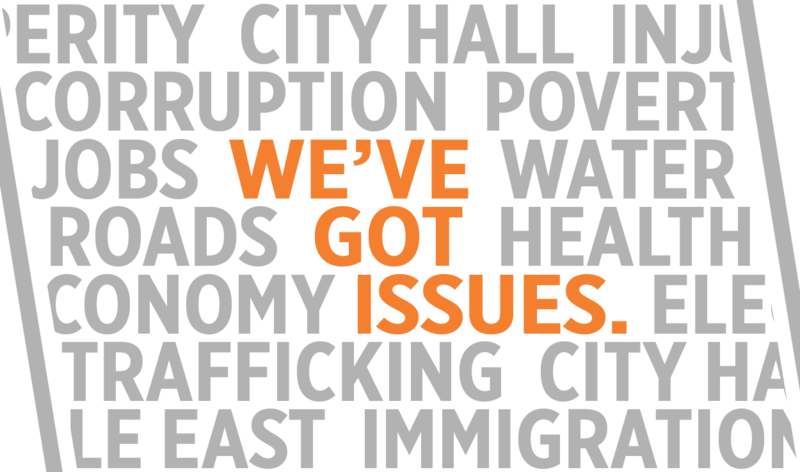 Everywhere you turn, there are big problems that our state leaders are failing to solve. Our roads are crumbling. Our schools are failing. Homelessness is skyrocketing. Our farmers go without water while fish and wildlife remain endangered. Meanwhile, we are spending billions every year on a high-speed rail system that might not ever be completed and utilizes technology that soon could be outdated. Nearly 70 percent of poor Californians spend more than half of their income on rent. No wonder they are fleeing to nearby states. Zillow reports that the median price for a home sold this March was $472,900. The median rent was $2,650. Why are rents and the cost of homes so high? According to a McKinsey Global Institute report, California needs 3.5 million more homes than it has now. Wasn’t anyone in Sacramento watching and coming up with ideas long ago on how to keep pace? Perhaps. But this is certain: Every idea must pass through a gauntlet of special interests before it becomes law. And those special interests — unions, NIMBYs and local governments — work overtime to take care of themselves, not solve problems. And then there is education. We are told that it is a sure-fire way out of poverty. 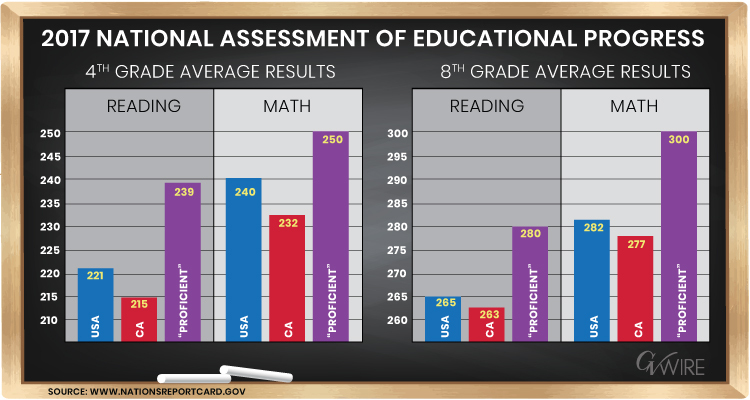 Yet, our schools are near the bottom of the pack nationally in K-12 performance and the educational achievement gap is huge for low-income students, especially Latinos and African Americans. You would think that California — home to Silicon Valley and some of the world’s brightest minds — would be on the cutting edge of education. It’s not. Why? 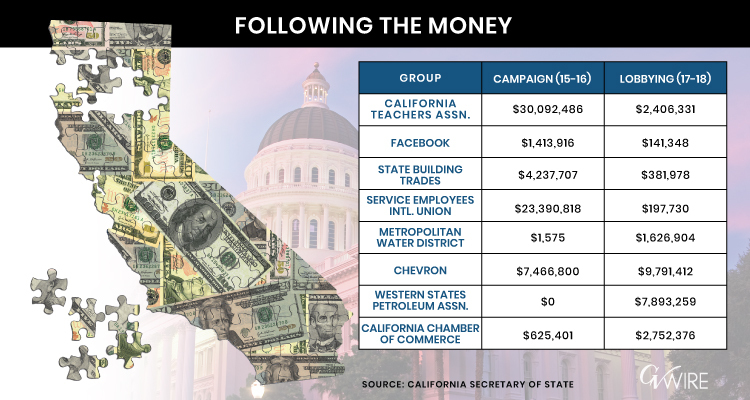 K-12 education is controlled by the California Teachers Association, which is most concerned about negotiating wages and benefits for its members. California’s leaders — all members of the Democratic Party, which is supposed to stick up for the little guy — mostly ignore these realities and instead brag about having the world’s sixth-largest economy. What they don’t like to talk about: California has more poor people (by percentage and total number) than any other state in America when you factor in the cost of living. 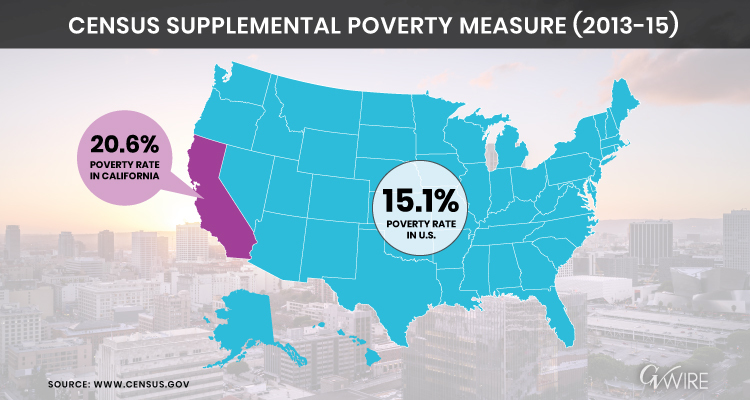 Nearly 21 percent of Californians live in poverty. Florida has the second-highest poverty rate at 19%. In this 2018 election cycle, GV Wire will pull back the curtain and explore why state leaders are really good at trivial pursuits — for example, passing a law at the ACLU’s urging, that makes it legal to snap pictures of your filled-out voter ballot and post it online — instead of figuring out how to get poor kids up to speed in math and reading. We kick off the effort with a look at a Baker’s Dozen of California’s Movers, Shakers and Blockers. The office itself is powerful. The governor proposes and has final say on the budget. He can grant pardons and commute prison sentences. He can veto bills that come to his desk from the Legislature. Last December, veteran California reporter and columnist Joe Mathews opined that California’s governorship had amassed so much power that it ranked second in the nation to the occupant of the White House. That said, Brown has commanded the office in a way that Gray Davis and Arnold Schwarzenegger never did and overseen a strong recovery from the Great Recession. Almost always, he is the adult in the room. The one with the savvy and intelligence to find a responsible path forward. And yet Brown, a master of political jiu-jitsu, decades from now might be best remembered for two massive infrastructure projects — high-speed rail and the Delta water tunnels. While high-speed rail is on a perilous path to fruition, the prospects for completion of the tunnels are bright. One Way the Governor Affects You: The power to sign or veto legislation potentially affects every aspect of life. From taxes to gender-neutral bathrooms to the size of gun magazine cartridges and much more, the governor has the last word. The teachers union describes itself as “one of the strongest advocates for educators in the country” and that’s not bragging. It co-sponsors legislation and endorses political candidates. It formulates strategies for negotiating salaries and working conditions for local chapters. Its political war chest, funded by the contributions of its 325,000 members, rewards friends and punishes enemies. Anyone who is serious about getting something done on the education front must get CTA’s blessing or risk the consequences. CTA spent $30 million on campaigns in 2015-16 and $2.4 million on lobbying in 2017 and early 2018. In this year’s governor’s race, it is all in behind Gavin Newsom and is part of a proxy war pitting the lieutenant governor against former Los Angeles Mayor Antonio Villaraigosa and charter schools. However, CTA — along with other public employee unions — could lose some power when the U.S. Supreme Court rules on Janus v. American Federation of State, County and Municipal Employees this summer. The case will decide whether to outlaw mandatory union dues for public employees. One Way CTA Affects You: The association unfailingly opposes changes to a teacher tenure system that provides lifetime job protections after the first 24 months. Elsewhere in the country, students are better protected from ineffective teachers by laws that grant tenure after three to five years of teaching. The company founded by Mark Zuckerberg wields two-fold influence. One, Facebook controls the flow of information, including news. Two, it is politically active. In the last election cycle, it donated $1.4 million to state office campaigns and ballot measures. It also spent $141,000 on lobbying in 2017, entering the fray on several high-profile bills that became law, such as the gas tax and a package of housing proposals. In addition, Facebook opposed two bills that would have increased internet privacy for consumers. Both bills are in legislative limbo. Other “Big Tech” firms such as Google are players, too. But, according to a 2016 survey by Pew Research Center, conducted in association with the John S. and James L. Knight Foundation, Facebook “is by far” the largest social networking site, reaching 67% of U.S. adults. Facebook has awesome power, but it might be weakening in the face of public scrutiny about sharing data. On April 11, the company announced that it would no longer be part of the campaign committee opposing the California Consumer Privacy Act, a proposed ballot measure that backers say will protect consumers and personal information. Facebook, however, still opposes the measure. One Way Facebook Affects You: Two-thirds of Facebook users get at least some of their news there. One change in an algorithm can determine what you see —and what you don’t —in your Facebook newsfeed, thereby influencing your decisions about candidates and initiatives. You’ve probably never heard of him. But everyone in the Capitol knows the face and name of the president of the 400,000-member State Building and Construction Trades Council. In fact, Hunter and his membership are why few Democrats have abandoned the controversial, overbudget high-speed rail project. Hunter is a staunch supporter of prevailing wage laws and project labor agreements. Here’s what he wrote in response to critics last year in a Los Angeles Daily News op-ed: “The idea behind the prevailing wage is to keep unscrupulous operators from low-bidding the legitimate competition to the detriment of the local workforce. The effect has been to allow blue-collar workers … to maintain their place in the American middle class.” In 2015-16, Hunter’s group backed political campaigns with $4.2 million. Its 2017-18 lobbying tally thus far: $382,000. 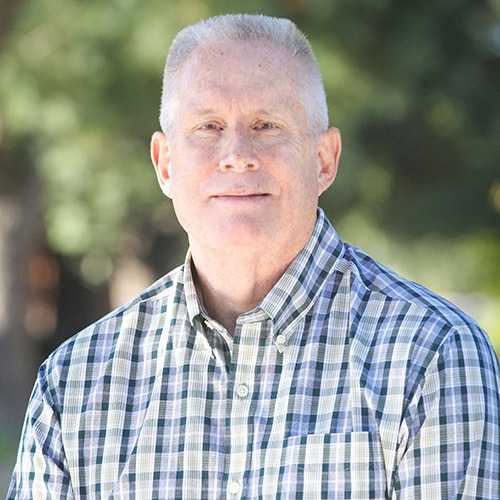 One Way Robbie Hunter Affects You: The inclusion of prevailing wage stipulations in much of the legislation aimed at alleviating California’s housing crisis raises construction costs anywhere from 9 percent to 46 percent, depending on which study is cited. In Fresno, a nonprofit developer said that prevailing wage, along with other state mandates, added $160,000 per unit to the cost of an affordable housing project. Those with a Not In My Back Yard mindset sometimes utilize the California Environmental Quality Act to block or delay projects. The landmark 1970 legislation signed into law by Gov. Ronald Reagan has accomplished many good things, especially when it comes to preserving our state’s natural beauty. But it also has helped drive the cost of housing to unaffordable levels and made it increasingly difficult to complete badly needed infrastructure projects. Moreover, both sides of the political spectrum wield CEQA like a hatchet. Businesses use the threat of CEQA lawsuits to discourage competition. Labor groups use them to encourage union-friendly hiring rules at the worksite. On the housing front, overly restrictive local zoning laws tighten the supply and raise costs for renters and home buyers. The Service Employees International Union represents public employees, health-care workers and blue-collar employees in food service, security and maintenance. It has 700,000 members in California, and is a huge force in elections and making or breaking proposed laws. SEIU donated $23.3 million in the 2015-16 election cycle, and Democratic candidates compete for its endorsement. The union put its big shoulder into last year’s passage of AB 168, which prohibits employers from asking job candidates about past salaries. It also backed the state sanctuary law and legislation that requires employers to give workers 72 hours’ notice of a potential visit by ICE officers. One Way SEIU Affects You: The union is pushing hard for universal healthcare in California. Depending on your point of view, you are applauding or booing. Though SEIU often puts the welfare of its members ahead of other California residents, it often stands up for consumers. One example: It backed Assembly Bill 72 in 2016. The law protects patients from so-called “surprise bills” after receiving care from in-network providers. Governed by a 38-member board, MWD procures the water that ultimately flows to 19 million people in southern California. How big is MWD? It single-handedly saved Gov. Brown’s Delta tunnels project by agreeing to finance two-thirds of the estimated $17 billion project after other agencies, including Westlands Water District, decided not to take part. Much of California’s future will be written by those who control water. MWD is the 800-pound gorilla of H20, and its influence will only grow if the tunnels clear environmental hurdles to become reality. MWD has spent $1.6 million on lobbying in this legislative cycle. One Way MWD Affects You: The future prosperity of California hinges on water availability. With Metropolitan going all in on the tunnels, it will have a big say in how much southern California residents and water-starved farmers south of the Delta pay for water. And if the tunnels operate in the manner predicted by proponents, fish such as salmon and steelhead will benefit, too. The headline in a 2014 Los Angeles Times profile said it all: “Mary Nichols has ‘rock star’ influence as top air quality regulator.” She served Gov. Brown as the head of the California Air Resources Board from 1979 to 1983 and then returned as the state’s air-pollution czar in 2007. Her passion for helping people breathe better and stopping the degradation of the planet was inspired by a long-ago visit to Los Angeles and seeing “a peculiar, Day-Glo, chemical kind of orange” sky. Nichols is a fearless negotiator but highly respected by those who oppose California’s strict regulations. Says The New York Times: “Nichols is the de facto enforcer of the single biggest step the United States has taken to combat the effects of climate change. … ” She also is a marquee proponent of ending housing sprawl and promoting transit-oriented development. In other words, she wants more people to give up their cars and take mass transit. One Way Mary Nichols Affects You: Every time someone gets in a vehicle in California, they are being regulated by the board under Nichols’ charge. CARB is the only state agency in the United States that has the ability to set its own clean-air standards, but 12 states have opted to follow California’s motor vehicle emission regulations. Automakers must meet CARB standards for cars sold in California and residents reap the benefits of better fuel mileage and cleaner air. With nearly 40 million people, 164.000 square miles and the world’s sixth-largest economy, California sometimes acts more like a nation than a state. That has been particularly true under Becerra, who was appointed by Brown to the state attorney general post when Kamala Harris left mid-term for the U.S. Senate. Becerra is the face of liberal “resistance” to the Trump administration’s positions on immigration and the environment. Besides representing the state on legal matters, his office plays a big role in law enforcement efforts. State law also gives the attorney general broad latitude in writing the titles and summaries for ballot measures. How those titles and summaries are worded can influence the decisions of voters and petition signers. One Way Xavier Becerra Affects You: It’s impossible to pick one. As the state’s top law enforcement official, Becerra has his hand in virtually everything: Medi-Cal fraud, elder abuse, fingerprinting, firearms, gambling, background checks, identity theft, internet auctions, and the list goes on. If you want to see everything, go to the A-to-Z list at this link. With billions of dollars in profits at stake, it makes sense for the oil giant to spend millions on lobbying and millions more backing candidates from both parties. Chevron is ever-present in shaping legislation, as is the five-states Western States Petroleum Association. The petroleum companies don’t always get exactly what they want in heavily regulated California. But they always get access to top decision-makers and a chance to tilt legislation their way. Chevron poured $7.5 million into 2015-16 political campaigns. For 2017-18, it is California’s biggest-spending lobbyist at $9.8 million, much of it involving cap-and-trade. While WSPA doesn’t spend much on campaigns, the trade group drops the hammer on the lobbying side: $7.9 million so far in 2017-18. One Way Chevron/Western States Petroleum Association Affects You: These savvy players figured out that it does little good to complain about the complexity of California’s fossil-fuels regulations. By adroitly navigating the regulations and the halls of the Capitol, they’ve established themselves firmly in a market which has half as many refineries as it did in the mid-1980s. In a state where the demand for gasoline — despite electric and hybrid vehicles — hovers around 4 million gallons daily, the relative lack of competition enables Chevron and others to charge more at the pump. Led by Allan Zaremberg, the group’s most effective tool is its annual “job killers” list. The chamber has put a bull’s-eye on 27 proposed measures for 2018. If history is a guide, the chamber’s efforts will be highly successful. Last year, 24 of the 27 job killers failed to reach Gov. Jerry Brown’s desk for an 89% kill rate. Though the chamber typically follows Republican orthodoxy, it will back Democratic efforts if the results appear good for business. As an example, the chamber backed last year’s gas-tax hike, saying it was needed because of the state’s transportation infrastructure crisis. Their big spending thrust is lobbying — $2.7 million in this legislative cycle. One Way California Chamber of Commerce Affects You: Though the chamber leans right and generally opposes tax raises and new taxes, its willingness to strike deals makes it a player in all kinds of legislation impacting residents and businesses. Thanks to the chamber’s efforts in 2013, Californians don’t have to pay a penny per ounce tax on soda and other sugary drinks, as state Sen. Bill Monning (D-Carmel) proposed. The tax would have totaled $1.7 billion annually, proponents estimated, with the money going to school and community programs targeting diabetes and obesity. The Republican who favors bow ties and suspenders is the son of a billionaire, a Republican activist, and a physicist at the Stanford Linear Accelerator Center. He also is passionate about transparency and good government, which makes him a hero in my book. He has contributed tens of millions of dollars to redistricting overhaul measures. And many millions more to Republican candidates and to trying to rebuild the state GOP. Last year, he gave $10.6 million in support of the successful Proposition 54, which requires all bills to be in print and published on the Internet for 72 hours before a vote. One Way Charles Munger Jr. Affects You: State and federal legislative districts, as well as the state Board of Equalization, no longer are drawn up by lawmakers after the census. Although the California Citizens Redistricting Commission isn’t perfect, it is a big improvement. That’s because lawmakers can’t choose their voters — as they often did under the old method. Sometimes the Legislature and the governor (in this case, Pete Wilson) do the right thing. Such was the case when they created the Bureau of State Audits (replacing the Auditor General’s Office) and made it independent in 1993. Howle has shown time and again that she’s only interested in the facts. Last year, her team took University of California President Janet Napolitano to task for hiding $175 million. Later, they blew the whistle on the fact that Napolitano’s staff had interfered with the audit. While the auditor’s office doesn’t have enforcement authority, it has the power to publicly embarrass bureaucrats and motivate elected officials to take action. Have something suspicious to report? Call Howle’s hotline: 800 952 5665. How Elaine Howle Affects You: Her team next could be knocking on the doors of a public agency in your town and uncovering illegal expenditures or mismanagement. One recent example: An audit of the nonprofit Community Child Care Council of Santa Clara County, which is bankrolled by taxpayers. Auditors discovered that the child-care agency improperly denied service to clients, misused state grants and delayed paychecks to day-care providers. Want to understand the often hidden dynamics of how California is run? Senate Bill 827, which recently died in the Senate’s Housing and Transportation Committee, exemplifies the importance of interest groups and coalitions in crafting and implementing policy. SB 827 was an ambitious undertaking that would have helped address California’s massive housing shortage by changing local rules to allow for higher-density development in spheres around public transit stops. Those naturally drawn to the bill out of perceived benefit, like the building industry and YIMBYs, have sway, but not enough power to pass a bill of this magnitude without including other interests. Some of these other interests were directly opposed to the bill and were unlikely to budge from their position out of their own vested interest. In this instance, local governments are probably the best example. They opposed SB 827 in essentially any form because it would have stripped local control. Other groups are often in support or on the fence about bills, but wait to show their support until being called to the table. It is then that they use their influence to extract concessions. Affordable housing advocates, environmentalists and the building trades fall into this category. Sen. Scott Wiener (D- San Francisco), the bill’s author, offered a number of amendments to attract their support, allowing for improved local control and tenant protections. Still, he failed to convince any of the four groups to support the bill. Opposition from the building trades was especially surprising — they didn’t have anything to lose via the bill’s provisions. However, they were unhappy about not being consulted on potential changes. One item sticks out: Prevailing wage and other labor-friendly mandates were not included in the amended version. This bill clearly illustrates the fate of well-intentioned legislation that seeks to fix big problems. 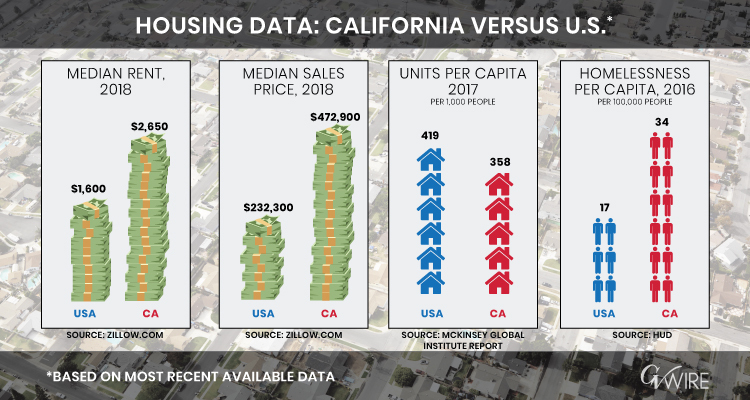 Meanwhile, the cost of homes and apartments in California continues to soar, largely because of the housing shortage. GV Wire’s Drew Phelps provided research on contributions and lobbying. GV Wire’s David Taub also contributed to this article. Sick of Robocalls to Your Cell Phone? Here’s How To Beat Them. SB 827 had problems in that it failed to actually align with transit corridors. The bill proposed circles of re-zoning, rather than rectangles which followed corridors and focused on empty parking lots! We need a bill to actually follow the corridors. We need to convert parking lots by re-zoning.